Another Gastonia act that recorded at RCA-Victor’s 1931 Charlotte field session was a twin-mandolin-and-guitar trio called the Three ’Baccer Tags, or, as they later became better known under the more dignified name, the Three Tobacco Tags, or, simply, the Tobacco Tags. During the Great Depression, their appealing repertoire of sentimental ballads, religious selections, pop songs, and comic novelty numbers, broadcast on stations in North Carolina and Virginia, made the Tobacco Tags one of the more popular radio hillbilly stringbands in upper Piedmont South. Originally, the Tobacco Tags consisted of mandolinists George Wade and Luther “Luke” Baucom and guitarist Reid Summey. All three men worked, at one time or another during the 1920s, in South Gastonia mills, and it was there that they first met and organized this stringband. Born in 1902 in McDowell County, in western North Carolina, Henry Luther Baucom (1902-1967), the group’s lead singer and mandolinist, had moved with his family to the textile town of Lowell, in Gaston County, before the age of eight. During the late 1920s, he worked, first as a twister hand and then as a section hand in the twister room, at the Seminole Mill in South Gastonia. There, around 1926, he met another Seminole employee, Edgar Reid Summey (1903-1975), a native Gaston Countian, the son of a textile mill superintendent. Baucom and Summey began teaming together to furnish the entertainment for church picnics, ice cream suppers, and other social gatherings in the mill communities Gaston County. Another local textile worker, mandolinist George Wade (ca. 1905-ca. 1958), originally from Davidson County, North Carolina, soon joined them to form a trio. Released during the depths of the Great Depression, the Three ’Baccer Tags’ record sold extremely poorly; the trio’s records from a second session, for Champion in August 1932, sold even fewer copies. Despite their initial miserable record sales, however, the band did go on to enjoy a great deal of commercial success. Beginning in 1934, the trio regularly broadcast over WPTF-Raleigh on a daily noontime radio show and over WBT-Charlotte on its popular Saturday-night Crazy Barn Dance, both of which were sponsored by the Carolinas and Georgia division of the Crazy Water Crystals Company, the manufacturers of a best-selling laxative. The Three Tobacco Tags’ growing radio popularity led to further recording sessions for RCA-Victor on its budget-priced Bluebird label. With an appealing mix of old sentimental songs, religious selections, current pop songs, and comic novelty numbers, the band’s later records sold quite well despite the ongoing Depression, and the group, which with several personnel changes eventually included as many as five members, recorded a total of eighty additional sides, many of which were written by Baucom and Summey, between 1936 and 1941. 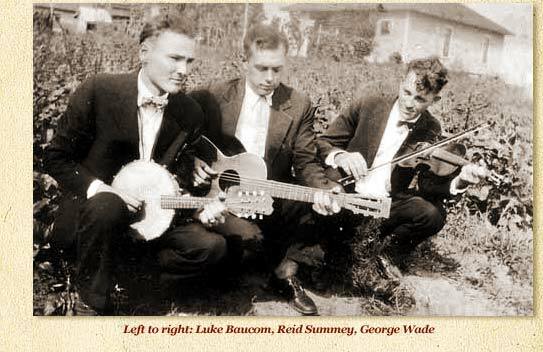 Meanwhile, George Wade left the group in 1938, but after his departure Baucom and Summey continued to perform together on the radio, tour professionally across the Southeast, and make commercial recordings, augmented at various time by other sidemen such as fiddlers Harold Hensley and Harvey Ellington, guitarist Bob Hartsell, and guitarist and bass player Sam Pridgin. In 1939, the Tobacco Tags moved to WRVA in Richmond, Virginia, and became regular cast members of its Old Dominion Barn Dance, where Baucom was known under the radio name “Looney Luke” and Summey became “Roly-Poly Reid.” By then, Baucom claimed that the band had performed in “more than 2,200 theatres, school auditoriums, churches and public halls” chiefly in Virginia and North Carolina, as well as in South Carolina, West Virginia, and Maryland. In 1942, the Tobacco Tags returned to WPTF in Raleigh for a three-year period. Meanwhile, during World War II, the Tobacco Tags played bills with Ernest Tubb, Pee Wee King, Mother Maybelle and the Carter Sisters, Minnie Pearl, and Grandpa Jones before disbanding in 1949. Prior to recording with the Three ’Baccer Tags, mandolinist George Wade had waxed a pair of vocal duets, at a 1929 Columbia field-recording session with a guitarist and harmonica player named Francum “Pickaloo” Braswell, a Caldwell County, North Carolina, farm laborer. James Francum Braswell (1908-1958) was born in 1908, the son of a farm family, in Piney, in Caldwell County, in western North Carolina. By 1920, however, his father and two siblings were working in cotton mill in nearby Lenoir, and although no definitive evidence has surfaced, Braswell himself may have worked in the mills, in either Caldwell or Gaston County. How Braswell and Wade met remains uncertain, nor is it clear how the duo came to audition for Columbia. However, in the fall of 1929, the pair traveled to Johnson City, Tennessee, to record at a field session, supervised by A & R man Frank B. Walker. 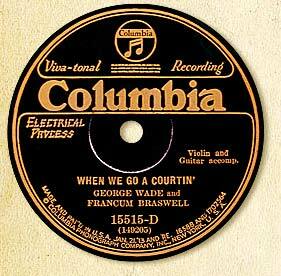 There, on October 21, 1929, in a makeshift studio set up in a former cream separator station, Wade and Braswell waxed two vocal duets for Columbia’s “Familiar Tunes, Old and New” series: Think a Little, a rather secular admonition to uphold the biblical Golden Rule, and When We Go A Courtin’, a comical cautionary tale about the hazards of courting. Wade went on to record more than fifty sides with the Three Tobacco Tags (including another version of When We Go A Courtin’ at an October 1936 session in Charlotte) between 1931 and 1938, and an additional ten sides as the leader of George Wade and the Caro-Ginians, at a single session held in Rock Hill, South Carolina, in September 1938. But the two sides heard here represent the entire known recorded output of Braswell, who demonstrates himself to be a fine harmonica player with a style resembling that of Gwin Foster.